N036 Byelka (Russian: Белка, literally Squirrel) is an advanced active electronically scanned array radar system developed by Tikhomirov NIIP for the fifth generation Sukhoi T-50 fighter aircraft. NIIP developed the radar from the N035 Irbis-E that was equipped on the Su-35S fighter aircraft. The radar is a part of the T-50's Sh121 multifunctional integrated radio electronic system (MIRES). 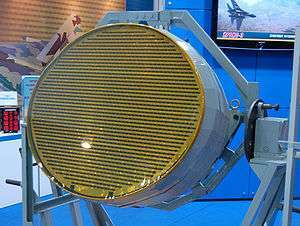 The N036 radar system is developed by Tikhomirov NIIP Institute and consists of a main nose-mounted X-band AESA radar with 1,552 T/R modules, designated the N036-1-01, and two smaller X-band AESA radars with 358 T/R modules mounted on the sides of the forward fuselage designated N036B-1-01. The suite also has two N036L-1-01 L-band arrays on the wing's leading edge extensions that are not only used for friend-or-foe identification but also for electronic warfare purposes. Computer processing of the X- and L-band signals enable the systems information to be significantly enhanced. The L402 "Himalayas" electronic countermeasures (ECM) suite made by the KNIRTI institute uses both its own arrays and that of the N036 radar. ↑ Андрей Фомин (2010). «Пятое поколение: у нас и у них» (приложение к журналу «Взлет»). Москва: Аэромедиа. pp. 38, 48–49. ↑ Butowski 2013, p. 79.